Last month, Jyotsna a friend of mine and member of Student for a Free Tibet called me and shared her concern and sadness on the rising number of self-immolations in Tibet. She was also very disturbed by not seeing any strong support from Govt. of India on the issue. So she wish to organize a candle light vigil in Delhi on behalf of Indian citizen and wish to call other Indian masses to stand for Tibet. I was very touched by her thoughts and support. As a Tibetan when we are going through one of hardest time in the history of our freedom struggle with almost 50 self-immolations in Tibet, this is the time we need support from International communities and Governments. Our discussion lead to organizing an online petition to Shri S.M Krishna, Minister of External affairs, Govt of India by Indians asking him to release a strong statement on critical Human rights situation in Tibet. The petition was launched on 15th august, India’s 66th Independence day on which we organized a public gathering in Delhi to observe India’s Independence Day. During the event we unveiled the re-creation scroll of the Declaration of Tibetan Independence issued by the His Holiness the 13th Dalai Lama in 1913. 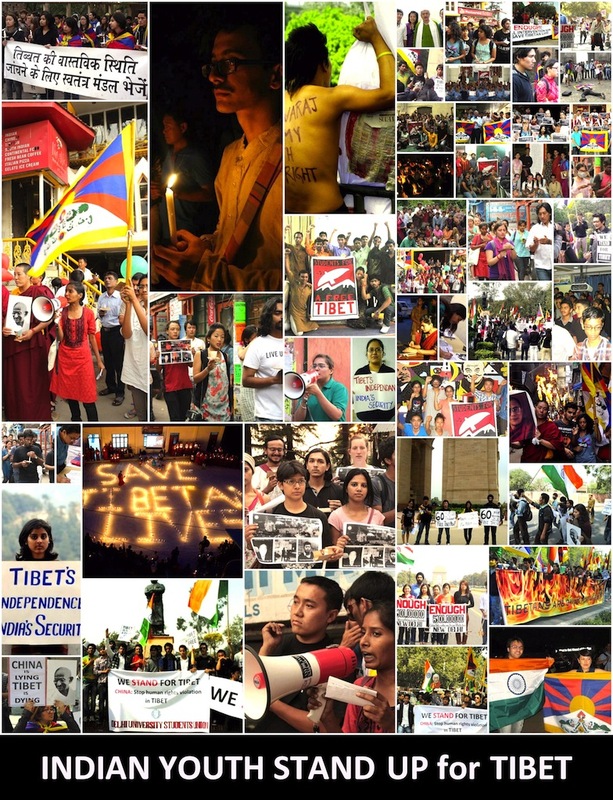 Click here for the letter Jyotsna wrote to her fellow Indian brothers and sisters to ‘Stand up for Tibet’. The event was jointly organized by Regional Tibetan Youth Congress and SFT-Delhi and more than 200 people took part in it, which include many prominent Tibet Supporters, college students, Youth, Tibetan community leaders and Indian members of Students for a Free Tibet. The declaration was also read in Tibetan, Hindi and English and at end of the event we launched our Petition by asking our Indian supporters to sign it. We plan to deliver the petition on October 2nd Gandhi Jayanti (Birth Day of Mahatma Gandhi) a day that symbolizes India ability to reject colonial rule through non-violence means which is the biggest inspiration for Tibetan Freedom struggle. There will be a national wide candle light vigil on that day in almost all the major Indian cities by our Indian members and supporters. I urge all the readers to share this note to your Indian friends.